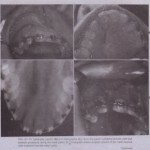 Individuals affected with cleft deformities, especially those of the palate, show skeletal discrepancies between the size, shape, and position of their jaws. 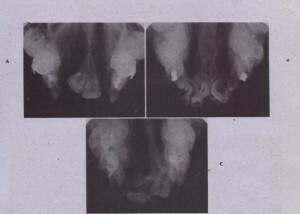 Class III malocclusion. seen in most cases, is caused by many factors. may partially contribute to the malocclusion. However, retardation of maxillary growth is the factor most responsible for the malocclusion. 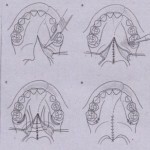 Generally the operative trauma of the cleft closure and the resultant fibrosis (i.e., scar contracture) severely limit the amount of maxillary growth and development that can take place. The maxilla may be deficient in all three planes of space, with retrusion, constriction, and vertical underdevelopment common. Unilateral palatal clefts show collapse of the cleft side of the maxilla (i.e., the lesser segment) to the center of the palate, which produces a narrow place arch. Bilateral palatal clefts show collapse of all omention or may have constriction of the posterior segments and protrusion of the anterior segment. complete ~Ieft of alveolus and palate. 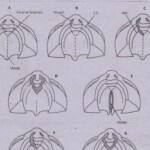 Note supernumerary teeth. correction of skeletal discrepancies and occlusal disharmonies is frequently necessary at this time.